Another way of expanding your do-it-yourself horizons is to try to consider storage as a movable concept. 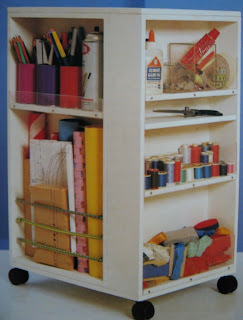 An itinerant kitchen and sewing trolley that can be moved to where you want, when you want, is just such an example. With the simple addition of peg-board, it could easily be converted into a workshop accessory. Use your imagination to adapt it for the laundry or study. The beauty of these units is that they can be hidden away in or under a cupboard when not being used. Each trolley consists of a base with four castors. The unit comprises two 99 mm deep shelved boxes with ply backs which are mounted on this base in one corner. This forms a right angle which gives rigidity to the trolley. The shelf arrangement can be as intricate or as simple as the items to be stored dictate. The best material to use for this unit is 12mm custom wood or ply (particle board is a possibility, too, but it requires edging).